It’s December! I am so excited for the holidays. It’s my favorite time of the year. Last weekend I decide to start my Christmas sewing projects and made this Free Pattern Mini Downtown Messenger Bag for my neighbor. I wasn’t so sure about the pattern as it turned out a tad too small for my liking. Nonetheless, I am sharing it with you all. Maybe there are someone out there looking for a mini messenger bag to give as a gift. The bag measures ~8″ long by 6″ wide. It comes with front pockets that hold an iphone or keys. I did velcro closure just because I am lazy and long thin fabric quilted straps to finish it up. Let me know what you think. I am leaning towards doing a full size pattern before the year is out. For this bag, I used a mixture of Cotton and Steel and Riley Blake fabrics. 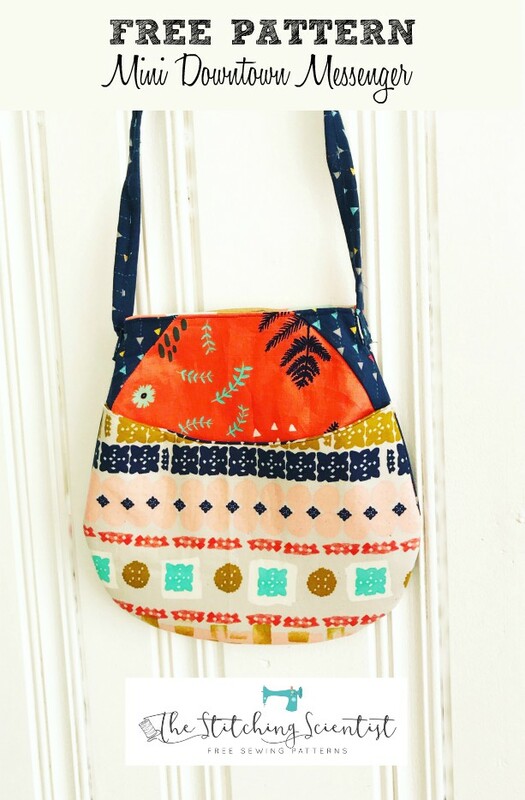 I used fat quarters to make this bag which made it easy to mix and match the fabrics. The front pockets are Cotton and Steel Paper Cuts Earth from Bandana Collection. The side and the back is Riley Blake Dear Diary Confetti Navy. The center is Cotton and Steel Fernbook Mesa. For the inside lining, I used Hobby Lobby Coral Mint and Gold Triangle Fabric. I am not about the fabric combination. I think it may be a bit too orange but I was looking for some contrast which I think it has enough of. I think if I make the full size of this pattern, I will do leather adjustable straps. I don’t like making straps and I always end up taking the easy way out and do something simple which is not always really functional. For this bag, I still may end up putting on some tabs and doing a really thin adjustable strap. To download the pattern CLICK HERE>>>FREE PATTERN DOWNLOAD.